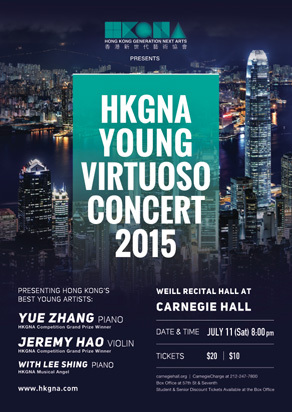 HKGNA proudly presented the Young Virtuoso Concert 2015 at Carnegie Hall. Bravo to grand prize winners of the HKGNA music competition Pianist Yue Zhang and violinist Jeremy Hao, Musical Angel Lee Shing for their fantastic performances! They performed to a packed house and received a rousing standing ovation! 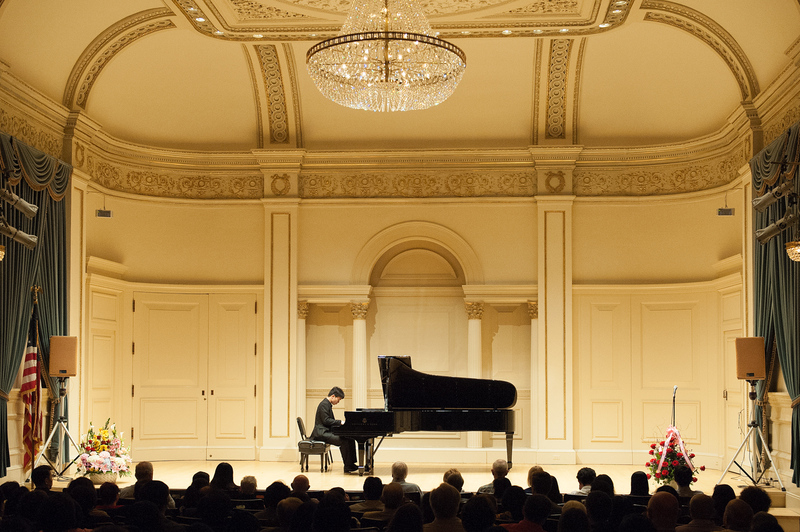 Yue Zhang began studied piano at 7 years old. In 2004, he was accepted by Shenzhen Arts School. At present, he is pursuing his bachelor degree in HKAPA with full scholarship tutoring by Gabriel Kwok. He has won Third Prize at the 1st Wenhua National Piano Competition in Xiamen and Silver prize (General Category) at the 14th International Piano Competition in Asia, Yamaha Music Scholarship and HKSAR Government The Talent Development Scholarship. He has performed in Shenzhen Concert Hall and Shenzhen Poly Theatre and appeared as soloist with the Shenzhen Symphony Orchestra, Xiamen Symphony Orchestra and Hong Kong Pan Asia Symphony Orchestra. 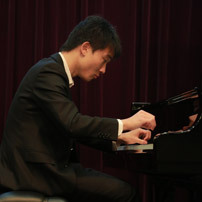 He was invited to give a solo recital in Shantou University. Recently he was invited to make his debut concert in Italy, and the concert was broadcasted to cities in Europe by classical music channel radio 3 Rai. He has participated in master classes of Dan Zhaoyi, Jerome Lowenthal, Boris Berman and Anton Kuerti. 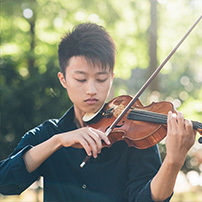 Jeremy Hao is a scholarship recipient for his Bachelor of Music Degree at the Mannes College The New School of Music in New York City, currently studying violin performance with Professor Sally Thomas. Previously, Jeremy studied at Wells Cathedral School in the UK as a specialist violinist with Ms Catherine Lord since 2009. During his time at Wells, Jeremy was awarded Full Scholarship and had solo performances with the Wells Cathedral School Symphony Orchestra as a prize winner of the Concerto Competition. Jeremy has taken part in many Orchestra and Ensemble concerts in the US, Europe and China. Also, It was a privileged opportunity working with maestro conductors such as David Hayes and Christopher Adey. As the first prize winner of the Young Artist Division (Strings) of HKGNA Music Competition 2014, Jeremy will perform at the Carnegie Hall and continue to pursue his music career in New York. Lee Shing experience serious vision impairment due to congenital retinitis pigmentosa. Despite his gradual worsening eyesight, Lee Shing continued with a strong pursuit of piano music. He gave his first solo piano recital in 2009. In recent years, Lee Shing has actively participated in various performances. 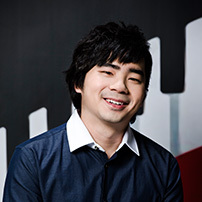 He performed with his brother Lee Hin in 2012, in a mini music concert titled “Blurred Music Notes” which is part of “The Sound of Art – Free Sunday Concert Series” held in the Hong Kong Museum of Arts. The same year also saw him perform with musicians from the Royal Academy of Music HK Alumni Association in St. John Cathedral for “Musical Bridge – A Charity Concert for the Arts with the Disabled Association Hong Kong”. He was awarded both The Most Outstanding Artistic Achievement Award and The Most Outstanding Performer Award at “Cross All Borders: Hong Kong Festival Showcasing New Performing Artists with Disabilities 2011”. Lee Shing is supported by Arts with Disabled Association.